Arsenal had been in all sorts of problems ahead of the AC Milan clash, losing four straight matches in all competitions, but the Gunners managed to show considerable improvement, winning the first leg 2-0. 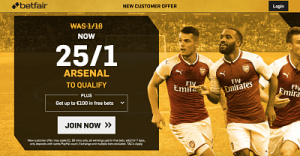 Having since enjoyed a comfortable triumph over Watford, Arsene Wenger’s men are expected to easily secure their place in the Europa League quarter-finals, and the good news is new Betfair customers who sign up through this link with promo code ZFBDMX are quoted 25/1 special price on Arsenal to qualify. New Customers can get Arsenal at an enhanced 25/1 to qualify for the next round (90 mins). Max Stake £1. Winnings paid in free bets. Full T&Cs Apply. 18+|Gamble Aware.